The Doedicurus (dee-dih-CURE-us) or "Doed" for short is one of the Mammals in ARK: Survival Evolved. The Doedicurus is a valuable work animal and is excellent at gathering Stone — even autonomously. Not only is it a highly capable work animal, but is also a very valuable animal to have nearby during a siege on an enemy base, as it possesses an ability to knock down walls similar to that of a Pachy. With their high health, relatively strong tail power, and ability to curl up once they've reached a certain damage threshold, the Doedicurus is a strong creature to have tamed. Doedicurus custosaxum is one of the Island's non-aggressive herbivores, generally found in the mountains and grasslands. Large and well-armored, it has a supply of fat under its plates to keep it warm and fed in the cold. Doedicurus has adapted well to the dangers of the Island, perhaps even better than the Ankylosaurus. Doedicurus has two very different reactions to predators. Against smaller foes, it generally uses its spiked tail to inflict as much damage as possible. 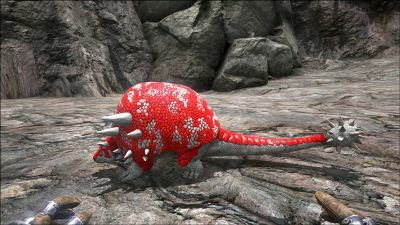 Against larger predators, however, it pulls its tail underneath itself to form a solid armored ball that is nearly impossible for creatures to pierce, from which it can actually "roll" away to relative safety! Doedicurus is a highly prized work animal on the island. Its spiked tail is ideal for quickly shattering the large rocks, so Doedicurus is a very efficient quarry worker. In addition, its affinity for rocks has allowed it to carry stone at a reduced weight. In case their quarry gets raided, Doedicurus-riders have a very difficult-to-kill mount! Doedicurus will attack when provoked. After taking a significant amount of damage they will roll into a protected shell, which reduces the damage they receive significantly. They uncurl after regenerating enough health to feel safe, and there is the possibility for a player to find themselves being chased by a vengeful Doedicurus unless they can get out of the creature's territory quick enough or simply make it lose interest. A Doedicurus will only roll into a protected shell once it has lost 2/3 of its health. Similar to an armadillo in appearance, the size of the Doedicurus is fairly small, being about 3–4 meters long and 1–2 meters high. 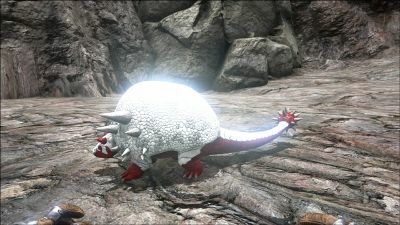 But this size should not hinder its capability in battle, due to its thick outer shell and club-like tail, the Doedicurus can be a tough target for even the larger animals on the island. Similar to the Ankylosaurus for protection, it is one of the most armored animals on the island, being able to keep itself safe from packs of Sabertooths. A blue coloration exists, but it is rare. This section displays the Doedicurus's natural colors and regions. For demonstration, the regions below are colored red over an albino Doedicurus. The colored squares shown underneath each region's description are the colors that the Doedicurus will randomly spawn with to provide an overall range of its natural color scheme. Hover your cursor over a color to display its name and ID. For example, "cheat SetTargetDinoColor 0 6" would color the Doedicurus's "shell and plates" magenta. Doedicurus prefer any of the Advanced Crops ( Citronal, Savoroot, Longrass, and Rockarrot) over berries when being tamed. These crops are all equally preferred, so any one will do. If no advanced crops are available, the creature prefers Mejoberries over other berries. Doedicurus take a very long amount of time to tame with Mejo or normal Berries, so try to invest in Regular kibble if possible. Due to their high torpor stat, Doedicurus are hard to knock out and can withstand a large number of Tranquilizer Arrows. They take 90% reduced torpor and damage when they are curled up in their protective shell and not moving. Using a Longneck Rifle and Tranquilizer Darts will knock it down with little risk of the Doedicurus curling up, making for an easy tame. A viable knockout strategy involves backpedalling away from the Doedicurus while continuing to unleash your tranq method. If you do not have access to a Longneck Rifle and can only use a bow or crossbow, simply back peddle as you fire arrows at the Doedicurus' head. Once it curls up, stop firing and wait for it to uncurl. The torpor will go down slightly but not enough to make it impossible to knock out. Just wait for the uncurl and repeat. Using a high-level Beelzebufo has some advantages if the creature is alone. One, you can save your valuable arrows and darts for more difficult targets. Two, you can lick it before it hits you and simply jump over its horizontal tail swing like a jump-rope, even landing behind it, just make sure you don't land within range of another attack. Using the basically infinite torpor-inducing attacks of the Beelzebufo, you can afford to keep hitting it after it curls up when your tranqs would be mostly wasted. When you see a lot of blood on the Doedicurus, you should start only using the primary attack as it does less damage so you won't kill it. Let the poison work by only licking your target once every 10 seconds or so, as the poison effect only stacks twice. This section describes how to fight against the Doedicurus. Since Doedicurus have the ability to curl up into an armored ball, hunting it is not very lucrative at lower levels. It provides a good amount of Raw Meat, Hide, and Keratin once killed, though, so at higher levels it is more rewarding. Using tranq darts before attacking can render low and medium level Doedicurus unconscious rather easily, and once unconscious the kill is easy. Another strategy is to move in, attack, and run away until it uncurls. This can be time-consuming, however, and is not advised. Another strategy is if near a body of water aggro it and kite it into it into the water. Once in the water, if you can get it to curl up in a ball it will drown itself. Even a Pike proves near useless once the Doedicurus has curled into its protective shell, so most weapons are ineffective. Using a Longneck Rifle and Tranquilizer Darts seem to be the most effective way of killing it, as an unconscious Doedicurus cannot roll into a ball. Almost all Doedicurus curl into a ball directly after an attack, but rarely they have been seen to attack. Their spiked tails pack quite a punch, and an angry Doedicurus is not to be trifled with in close combat. Tranquilizing and then killing a Doedicurus is most definitely the quickest and most effective means of defeating it. It will also drown if it curls in the water since it will sink below the surface and stay enrolled till it suffocates. Travel: Excellent ATVs due to their ability to roll at high speed and surprising agility in the water (Level Speed, Stamina, and some Oxygen). Gatherer: Amazing for gathering materials. Highly recommended for stone, sand, and thatch, and not recommended for wood. As of patch 256.3 (PC), Doedicurus received a 75% weight reduction to stone in their inventory, allowing them to carry much more before becoming encumbered (Level Melee Damage and Weight). Tank: Decent tank with high HP and very good base damage and AOE. Can chase prey with the rolling ability (Level Health, Melee Damage, and Stamina slightly). Doedicurus will curl up when its health drops below 2/3 of its max. They will ignore follow commands while curled up; riding a Doedicurus is the only way to overrule its desire to hide. When curled up, they take 90% reduced torpor and damage and will not move. Turrets will NOT stop shooting at a Doedicurus if it is curled up. While riding a Doedicurus, Press 'Alt Fire' rmb to roll instead of run. When you are rolling, you are unable to toggle running and you lose the ability to change direction. Press 'Alt Fire' rmb again to stop rolling. The Doedicurus gathers stone autonomously while on wander or if left parked next to a suitable rock. It also has this ability while being carried, allowing for a safer and more mobile method of resource collection. It is recommended that an Argentavis be used for their superior mobility and carrying capacity. In Scorched Earth, a Doedicurus is useful to gather a lot of Sand. The Doedicurus can also gather Obsidian from the shiny black obsidian rocks. However, there are two types of these rocks that you can't distinguish visually, one will give obsidian the other will not. Mostly you will find the second. Doedicurus will automatically harvest rocks when set to wander. Dino Dossier revealed on 07/08/2015. Doedicurus can roll up into a ball and roll around, even with a rider on its back. It is the only other animal besides the roll rat (Aberration) that can do this. If using Aberrant Doedicurus to harvest on the Aberration map, be mindful it is not immune to radiation and you will need to feed it Mushroom Brew every 120 seconds to keep it from suffering from radiation exposure when in irradiated areas of the map. The full name of the Doedicurus custosaxum translates to "Pestle-tailed stone warden", likely a reference to its use in gathering stone and defensive capabilities. Doedicurus belongs to a group of armadillo-like (They are, indeed, related) mammals known as Glyptodonts. The Doedicurus can use its melee attack while being carried by a Quetzal. A Doedicurus with Wandering Disabled parked at the front of a raft can gather incredible amounts of stone for the player when sailed up a rock-choked river. The dino will swing at rocks as they pass and his burden becomes irrelevant. This handily compensates for the inability to bypass his burden with a Quetz as detailed above. Any Doedicurus that has rolled into a defensive ball will not uncurl if it finds itself under water and will swiftly drown. Players with access to a Quetzal will likely find this the quickest method of killing unwanted low level spawns. Blue Doedicurus can rarely spawn in the wild. This, together with their ability to roll into a ball and charge their enemies, is possibly a reference to the video game character Sonic the Hedgehog, a blue hedgehog whose signature attack is to roll into a ball to charge at enemies. Doedicurus can still be knocked out when curled up. Doedicurus actually has a bite attack, however it can only be triggered while swimming.